Positive Material Identification (PMI) Testing | QCML, Inc. Typical process of testing parts utilizing a Niton XRF instrument. Quick way sort materials or verify suppliers as part of a quality assurance program. Q.C. Metallurgical Laboratory Inc. has utilized XRF analysis for positive material identification for over 25 years. To insure the quality and reliability of our test results QCML is A2LA accredited to ISO 17025 for XRF analysis. When you’re under tight time constraints and need PMI testing to sort parts, prepare parts for shipment or just to verify suppliers, QCML can usually dispatch a technician within 24 hrs. Our technicians have the experience to work with your customer and 3rd party inspectors. 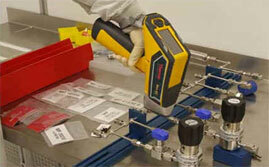 All of our technician operate high quality Niton XL2 Gold XRF alloy analyzers. We utilize certified reference materials to type match the materials were testing to insure accurate and reliable results. Our technicians arrive with certified certificates for the standards and procedures that will meet the stringent requirements of your inspectors. 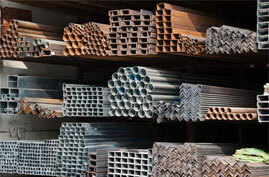 Iron Based Alloys: Stainless, chromium/molybdenum steels, tool steels and some low alloy steels. Any part that the instruments sensor can make contact with. Pump parts such as welds, flanges, blades. One of the key elements of XRF analysis is that it’s a non-destructive testing method and does not damage or mare the part. X-Ray Fluoroscopy (XRF) uses a radiation source to excite the electrons in the materials under the tests and obtains an elemental fluorescent spectrograph, a chemistry of the material. The chemical analysis is compared to the instruments library of commonly used material grades. So the instrument is able to generate a chemistry of alloying elements and determine the material grade. This is a very quick and accurate way to test alloy steels. Since the instrument detects alloying elements but cannot detect carbon, the instrument cannot differentiate between the various grades of low alloy low alloy carbon steel. Contact QCML and speak with a metallurgical engineer if you have any questions regarding the applicability of PMI testing for your needs. Al, Ti, V, Cr, Mn, Mg, S, P, Fe, Co, Ni, Cu, Si Zn, Gf, Ta, W, Re, Zr, Nb, Mo, Pb, Ag, Sn, Pd. *Instrument does not detect carbon.